My preferred method of generating income from my investments is just plain old dividend growth investing. I love that the most because it's a truly passive source of income that requires no work and very little monitoring on my part once the initial research on the company/valuation is complete. The problem with dividend growth investing is that it requires a large capital base in order to generate substantial amounts of income. I've been testing out ways to generate investment income via option trading because the income can be substantially higher. If my experiment proves viable over different market cycles I would have no problem using options as a way to supplement our income if it would allow us to reach financial independence faster even if that means a more active approach is required. Last week started off pretty slowly for my options trading, but by the end of the week it ended up being quite busy. Unfortunately, this wasn't exactly a good week for generating option profits due to some losing positions. However, thanks to diversification among underlyings and strategies it was still a profitable week. TastyWorks is really geared toward options traders with $1 per contract commissions and $0 to close; however, even for just long term dividend growth investors it's an intriguing choice. For stock purchases commissions are $5 to open and $0 to close which is still much lower than just about every brokerage out there. If you're interested in opening an account with TastyWorks I'd appreciate it if you do so through this link. Tesla's run over the last month or so has been truly amazing. 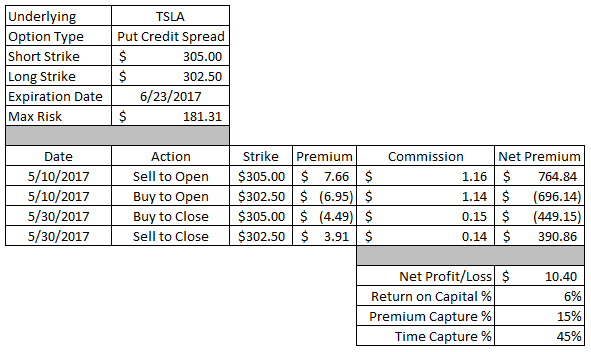 Unfortunately I closed this position out way too early since Tesla continued its move higher not long after I closed this position out. This trade generated net profits of $10.40. With $181.31 of capital at risk on this position that's still a solid 6% return on capital. 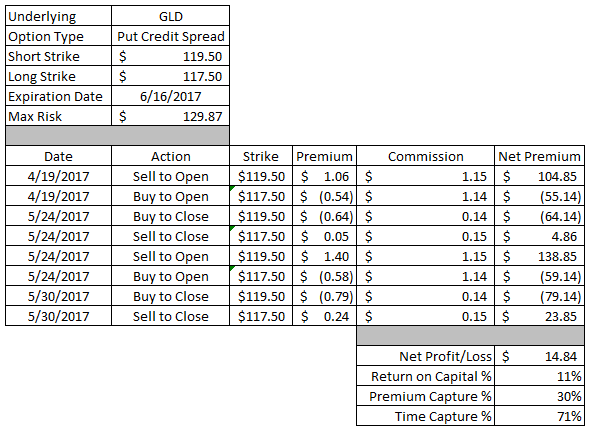 I was able to capture just 15% of the maximum potential profit in 45% of the days until expiration. I honestly didn't want to close this position out when I did and messed up the closing order when I put it in. To start the closing order I used my brokerage's "close @ profit %" function and apparently didn't adjust it to reflect what I actually wanted to take out of the position. Ooops! Unfortunately this wasn't the only position I did this on either. This position generated net profits of $14.84. With $129.87 of capital at risk on this trade that's a decent 11% return on capital. I was able to capture 30% of the maximum profit in 71% of the days until expiration. 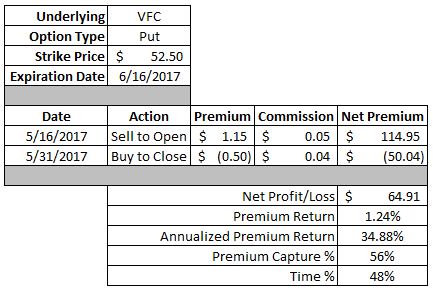 Since acquiring shares of V.F. Corporation earlier this year I've continually sold options around the position in order to take in more premium and reduce the cost basis on my shares. So far that's worked out great as I've been able to reduce my basis from $53.50 to $48.85 or around $4.65 per share. This put option produced net profits of $64.91. With $5,250 of capital securing the contract that's a solid 1.24% return on capital. That works out to a solid 34.9% annualized return. 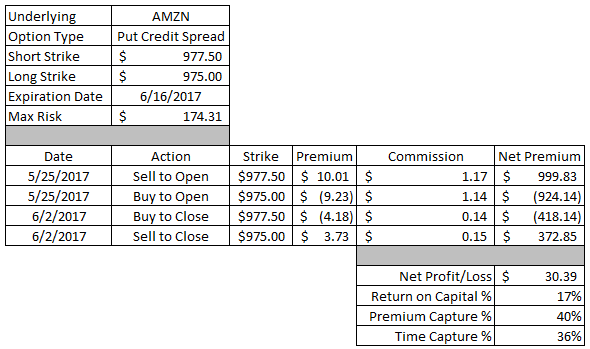 I was able to capture 56% of the maximum potential profit in 48% of the days until expiration. Micron continues to have high implied volatility in its option prices and with it's low per share price and generally bullish short/intermediate term business outlook I'm more than happy to use the company as a way to generate option income. This trade generated net profits of $42.91. Since $2,850 of capital was required to secure the position that's a solid 1.51% return on capital. The equivalent annualized return is a hefty 148.4%. 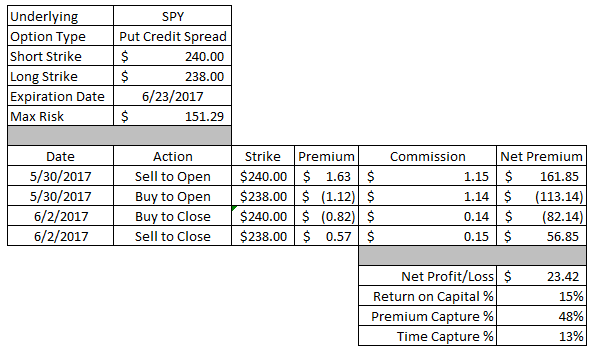 I was able to capture 54% of the maximum potential profit in just 21% of the days until expiration. I opened this position on a Wednesday, but by Friday it was time to take it off. Normally I don't expect to be able to take a good chunk of option premium as profits in such a short time, but if the markets work with me then I'll gladly take it. This put option generated net profits of $84.91. With $12,500 of capital securing the contract that's a solid 0.68% return in just 2 days. That's equivalent to an annualized return of 244%. I was able to capture 44% of the maximum profit in just 13% of the days until expiration. This trade worked out wonderfully and I was able to close it out for nearly 50% of the maximum profit in a fairly short time frame. Unfortunately in this account I've been having to widen out the spreads on my trades because there just isn't enough premium coming in to make closing the positions out worthwhile. Sadly that comes with higher risk since many of these are directional bets too. This position produced net profits of $24.42 with $147.29 of capital at risk. That's a solid 17% return on capital. 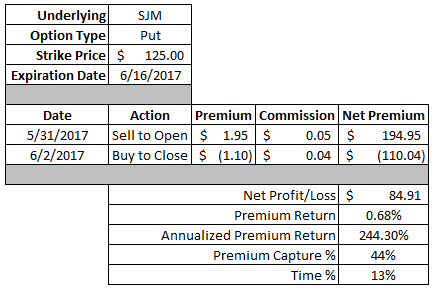 I was able to capture 46% of the maximum potential profit in just 16% of the days until expiration. Many of my short option plays, bets that the market would decline some, were struggling mightily. So I started putting on some bullish plays in some of the companies that never seem to go down. This trade generated net profits of $30.39. With $174.31 of capital at risk on this position that works out to a 17% return on capital. I was able to capture 40% of the max potential profit on this trade in 36% of the days until expiration. In hindsight I probably should have just let this one play out and see if EFA happened to come back into the profitable zone. But I decided to just throw in the towel on this position because I was frustrated with how several of my positions were going. This trade had realized losses of $52.16. Yikes! Thats a -70% return on capital. I originally put this position on to try and have some positions that would benefit from a continued increase in the markets. Little did I know that I would be taking it off just a couple days later after reaching my profit target. This position generated realized profits of $23.42. With $151.29 of capital at risk that is a solid 15% return on capital. I was able to capture 48% of the maximum potential profits in just 13% of the days until expiration. I was surprised to check my account on June 3rd to see that my short put option against Nike was executed early. It's not too surprising considering it was well in the money; however, since there was still 2 weeks until expiration I figured I still had time to try and roll it out to pick up more premium. Alas that wasn't to be. Since the put option was exercised I had to purchase 100 shares of Nike at the $57.50 strike price. 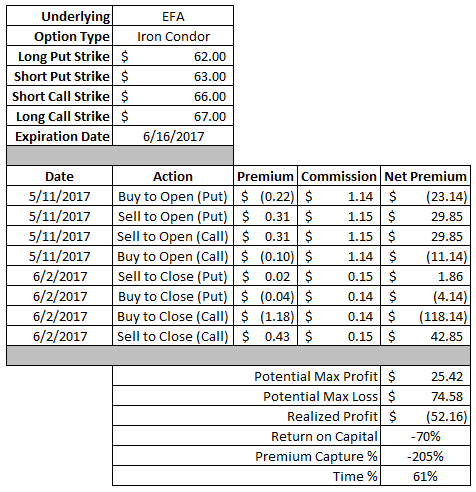 However, since I had picked up $222.59 of option premium along they way my effective purchase price on these shares is $55.27. Based on the current annual dividend of $0.72 this lot carries a 1.30% YOC. I only generated net profits of $135.82 for the week ending June 2nd. That was a fairly significant decline compared to how the last couple months have been, but it was still a profitable week. For the month of May I realized net profits of $2,288.67 which was my most profitable month yet. The first 2 days of June saw a minuscule gain of just $2.76. Year to date my option profits are at $8,429.98. Tough news on the NKE execution but looks like you did well with the options otherwise. I have also been playing MU with put options. Great minds think alike! Financial investment is important for all of us. Thank you for your update and keep it growing. 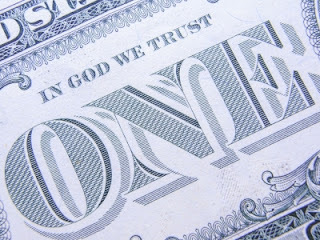 According to my best ideas, first of all Financial investment is most important for all of us and usable. It is a great minds think alike. Thanks you so much.